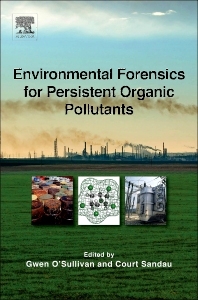 Environmental Forensics for Persistent Organic Pollutants represents the state-of-the-art in environmental forensics in relation to persistent organic pollutants (POPs). The book is a complete reference for practitioners and students, covering a range of topics from new analytical techniques to regulatory and legal status in the global community. Through case studies from leading international experts, real-world issues — including the allocation of responsibility for release into the environment — are resolved through the application of advanced analytical and scientific techniques. This book introduces and assesses the development of new techniques and technologies to trace the source and fate of newly emerging and classic POPs (perfluoroalkyl substances, brominated flame retardants, organochlorine pesticides, perfluorinated chemicals, polycyclic aromatic hydrocarbons, and polychlorinated biphenyls) in environmental media, including atmospheric, marine, freshwater, and urban environments. Dr. O’Sullivan is an environmental chemist whose technical expertise includes environmental chemistry, environmental forensics, and contaminated land and groundwater. Dr. O’Sullivan earned a BSc in Environmental Sciences from University of Limerick, and a PhD from the Environmental Engineering Research Center within the department of Engineering at Queen’s University of Belfast. She has worked on numerous projects including the development of technologies and remedial actions plans for the treatment of petroleum hydrocarbon, chlorinated solvent, and saline impacted sites. She has also designed and managed environmental forensics investigations involving compounds of concern including drilling fluids, petroleum hydrocarbons, polycyclic aromatic hydrocarbons, polychlorinated biphenyls, polychlorinated dibenzo-p-dioxins and dibenzofurans, methane, and nitrates. She has also authored several successful research grant applications to major research councils, both nationally and internationally. Dr. Sandau is an analytical environmental chemist with expertise in environmental forensics investigations, biomonitoring, data quality and data validation, legal sampling, and expert witness and litigation support. Dr. Sandau obtained his Bachelor of Science degree from the University of Western Ontario and his PhD from Carleton University. Dr. Sandau has developed and validated numerous analytical methodologies to quantify many different chemical contaminants and written standard operating procedures to meet the stringent criteria of laboratory governing bodies. Dr. Sandau specializes in evaluating and establishing strict quality assurance and quality control for investigations involving analytical data from sampling techniques and strategies to third party data validation. Dr. Sandau’s experience includes working at the Centers for Disease Control and Prevention (CDC). At CDC, Dr. Sandau managed a laboratory responsible for the analytical toxicology and exposure assessment of humans to environmental contaminants. He has been involved in numerous epidemiological studies (including recruiting public participation) examining the impact of chemical contaminants on cancer, endocrine function, brain development, and other measures of health impacts. Previously, Dr. Sandau worked at the National Wildlife Research Center measuring contaminants in environmental and wildlife samples with the purpose of examining the biomagnification, biotransformation, and toxicological effects of priority pollutants in the arctic and Great Lakes food webs. Dr. Sandau is currently the sole proprietor of Chemistry Matters and is an Adjunct Professor in the Engineering Department at the University of Calgary where he lectures on the subject of environmental forensics.